Week in review for period of September 17, 2010 to September 23, 2010. For more information, contact your WGES Account Manager or wges_lgc@wges.com. The month of September has been uneventful. As a result, energy prices during the month have remained relatively flat. For this 7 day period, the 12 month average price for natural gas at the well-head fell 1%. 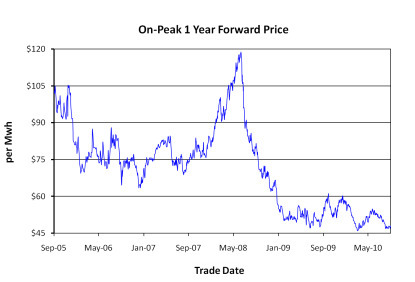 The 12 month average price for peak power on the PJM also fell 1%. Natural gas prices remain at a seven year low and electricity prices remain at a six year low because heating demand has not started, cooling demands are very low, the natural gas inventories are still 6% above the 5 year average and the economy is still in a slow growth mode. Is this the bottom for prices? Fundamentally, there is nothing noteworthy happening in the market to dramatically move prices for now. However, all eyes are focused on the new tropical storm named Mathew that has developed in the Caribbean. The storm appears to be headed for the Gulf where the oil rigs are located. Stay tuned. Hurricane season ends Nov. 30. Storage Update: We have six weeks left in the injection season. This week’s injection was 73 Bcf. As a result, the deficit from a year ago shrunk from 5.3 % to 4.9%. 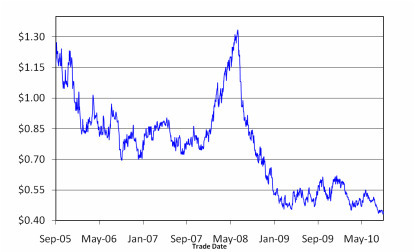 The surplus relative to the 5 year average remained the same at 6.2%. Now that the extreme heat is gone, the need for gas fired generation is down and thus more gas is going into storage. Weekly Drilling Rig Update: Active rig count released by Baker and Hughes for the week ending 9/17/10 was 982 rigs which was a net increase of 2 rigs. This is the 3rd week in the row it has increased. The count is 277 higher than the count reported this same week last year. We are 20% below the 5 year avg. rig count of 1227. Washington Gas Energy Services strives to provide concise and accurate information from dependable sources for information contained in this report. Nevertheless, Washington Gas Energy Services does not warrant the authenticity of such information. This report is not intended to serve as a trading tool for customers or for potential customers. If you would like to like to receive this information via email, please send your request to wges_lgc@wges.com. To ensure delivery of the ENERGY UPDATE, please add wges_lgc@wges.com to your email address book or Safe Sender List. If you are still having problems receiving our communications, see our white-listing page for more details.